All our windows boast A Rated double glazed units as standard. Warm edge spacer bar technology and Argon gas other glazing option include stained glass and bevel designs and a variety of lead and Georgian bar configurations. As with all our double glazed windows, we offer an amazing range of beveled glass designs and lead designs. All designs and leads are available with any glass we offer. Not content with White UPVC? Our range of beautiful colour finishes include rosewood wood grain, golden oak, cream and black. 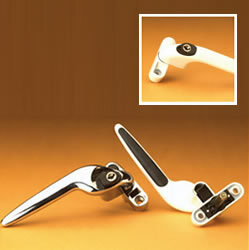 As standard our windows are available with white, gold, chrome and black handles.